Friday night I finally corrected the error that was not yet having made it into Chaval. This West End restaurant has been open for 7 months or so, but I'd yet to make it "alllll" the way over to the other side of the peninsula to try it. Chaval is the second restaurant from Damian Sansonetti and Ilma Lopez, the chef couple that owns Piccolo. The duo purchased Caiola's and closed it to freshen up the space and reopen it with a new concept. 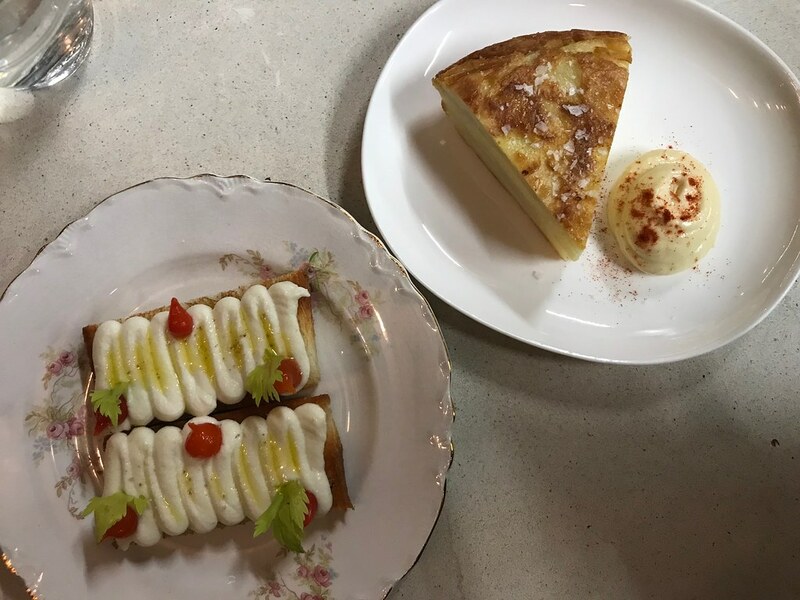 The menu features Spanish and French dishes and seems to draw inspiration from tapas/pintxos with a selection of inexpensive snacks like tortilla, brandade (whipped salt cod), and house cured meats. 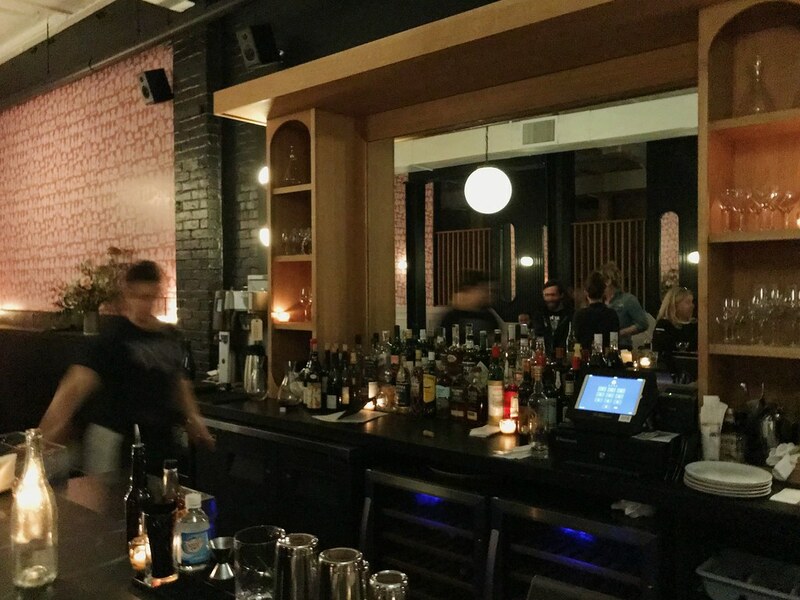 Anyone who frequented Caiola's will enjoying seeing the rennovation of the bar and kitchen area—the restaurant now has an open feel, versus the cozy nooks created by the walls in its previous iteration. Due to the soggy weather we had the night I visited, there wasn't a wait even though it was 6 p.m. on a Friday night, and we found two seats at the bar (right next to the kitchen, where the heat lamps kept me warm). We caught the tail end of happy hour, where a rotating special features a few $5 snacks and sherry. To drink, I ordered a take on the Brown Derby, a bourbon, Benedictine, blood orange, and grapefruit cocktail. It was tasty, but I loved most of all that it was big. Even if it was mostly ice or juice, I just appreciated the volume of the drink. I'm tired of rationing 4 oz. cocktails with tiny sips. To start, we ordered the brandade ($6) and the tortilla ($4). The salt cod needed, well, a little salt, and then it was a delicious spread with pops of flavor from the pickled sweet peppers. The egg and potato tortilla was perfect, topped with flaky salt and served with a dollop of mayonnaise. The next round of snacks was the lettuce and nuts salad ($9), North Spore 'shrooms ($12), and beef tartar and bone marrow ($13). 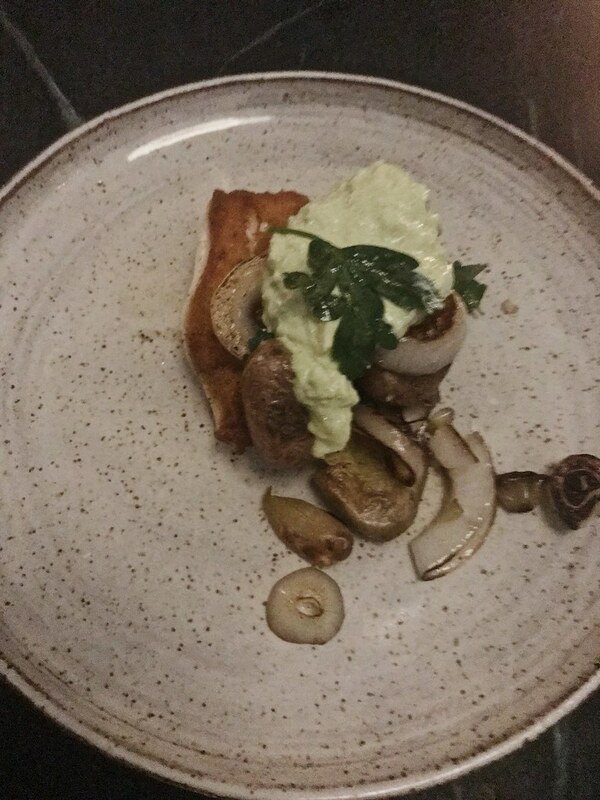 The 'shrooms with duck egg and chorizo was hands down my favorite dish of the night. The mushrooms were full of flavor, and the chorizo gave it all a salty richness. 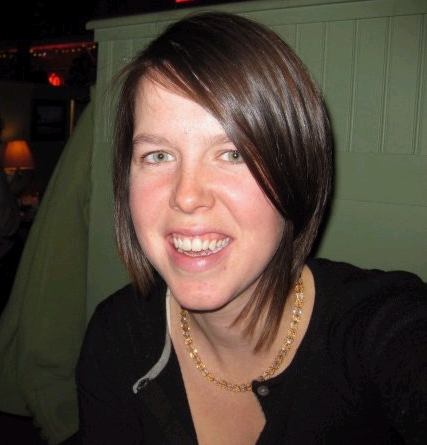 The beef tartare and bone marrow wasn't for me—I just wasn't feelin' the bone marrow that night. But the beef tartare topping with zingy pickled onion and mustard seed was excellent on the griddled toast. And the salad with endive, pickled red onions, and bleu cheese was a fresh foil to the other dishes. Our meal was about $90, including tax and gratuity. One thing Damian, Ilma, and company excel at is making you feel welcome. We left feeling like we'd spend the evening hanging out with friends, sitting at the bar, and engaging in some witty banter (theirs, not mine 😉). 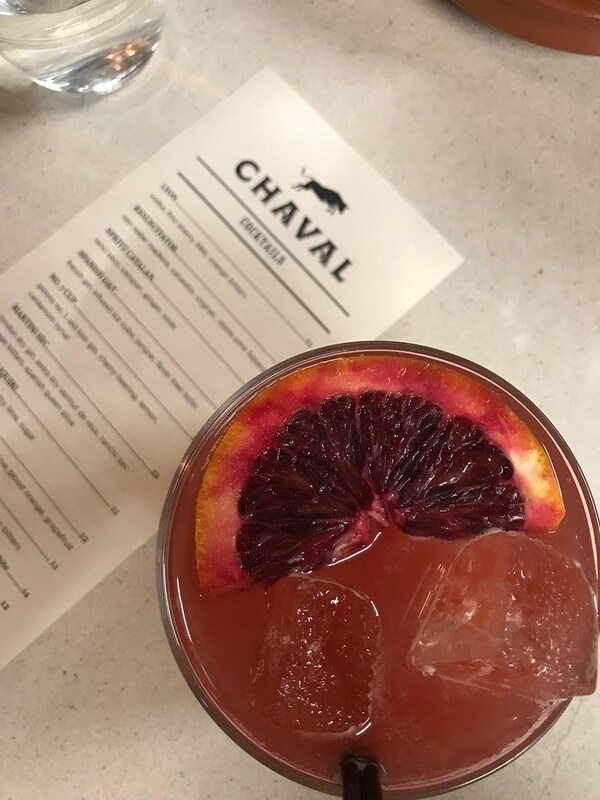 With dishes that encouraging sharing, Chaval is the perfect place to catch up with friends over some snacks and drinks. 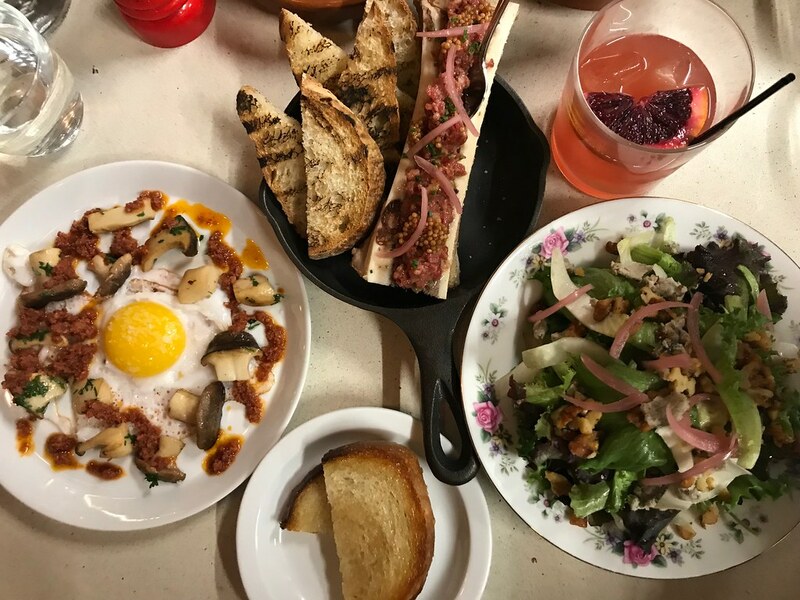 Drifters Wife reopens in its new spot today, after moving next door into a larger space that was formerly occupied by Roustabout. The new space has been completely rennovated, with a wall down the middle that sections off the natural wine bar from the retail shop. And the decor has been updated, with a modern, dark look that is very different than the old space, but still conceptually similar with funky accents. The food and drink menu retain the same feel as in the old space—maybe not the same items as before, but both changed frequently anyway. I didn't look closely at the wine menu, because I don't tend to know too many of the wines owners Peter and Orenda feature, instead asking for recommendations based on my preferences. I started with a pinot noir and then enjoyed a fizzy, fruity rose (the second one I picked just because I saw it being poured out of a giant bottle and was like, I want that). 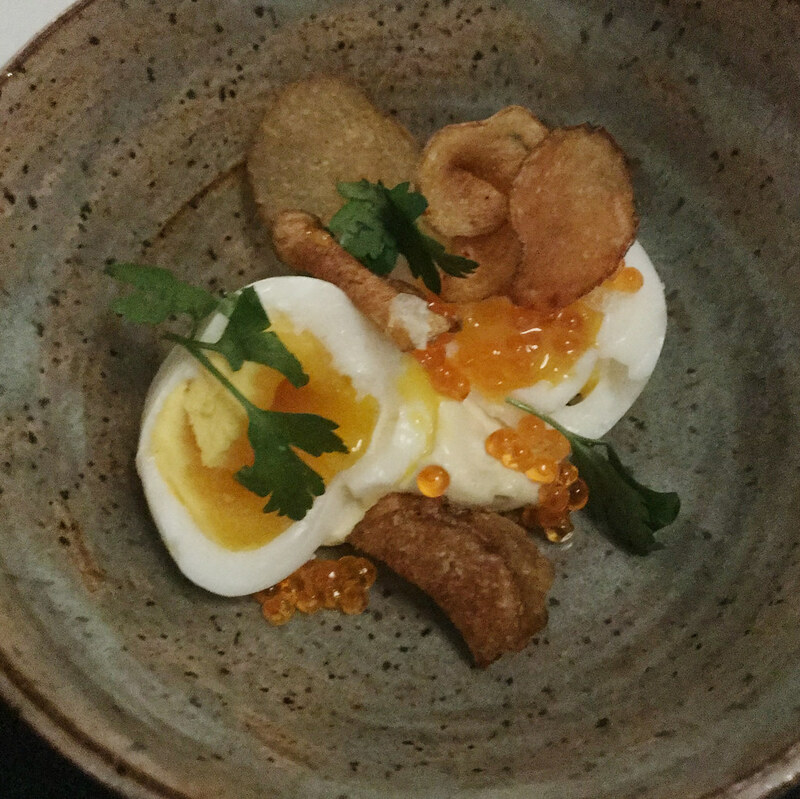 To go with the wine, we ordered the egg with trout roe, potato chips, and mayo ($9) and toast with duck liver mousse and pickles ($12). Egg was basically egg salad with potato chips—not for everyone, but pretty much my dream snack. Same with duck liver mousse—could eat tons of, probably should not actually do that. Other starters/small plates include bread and butter, olives, cashews, beet salad, and cabbage with turnips. 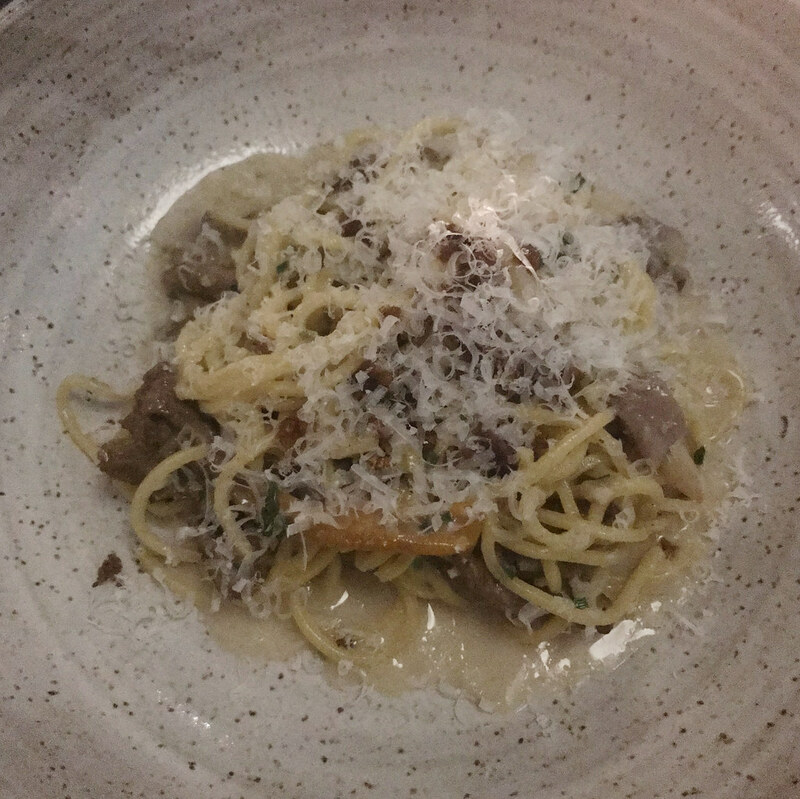 We shared the spaghetti with clams, beef tongue, and chanterelle mushrooms ($16) and the hake with potatoes and sweet onions ($28). Both were amazing—the pasta was coated with a creamy, egg sauce like carbonara and the hake skin was crispy with a creamy herbed sauce draped over it. Other entrees include chicken with carrots and pork with beans and kale. There's two desserts—malabi (an Israeli custard) with blueberries and date cake with meyer lemon and mascarpone. We skipped dessert, since we'd been there for three hours, but I'm regretting that choice now. 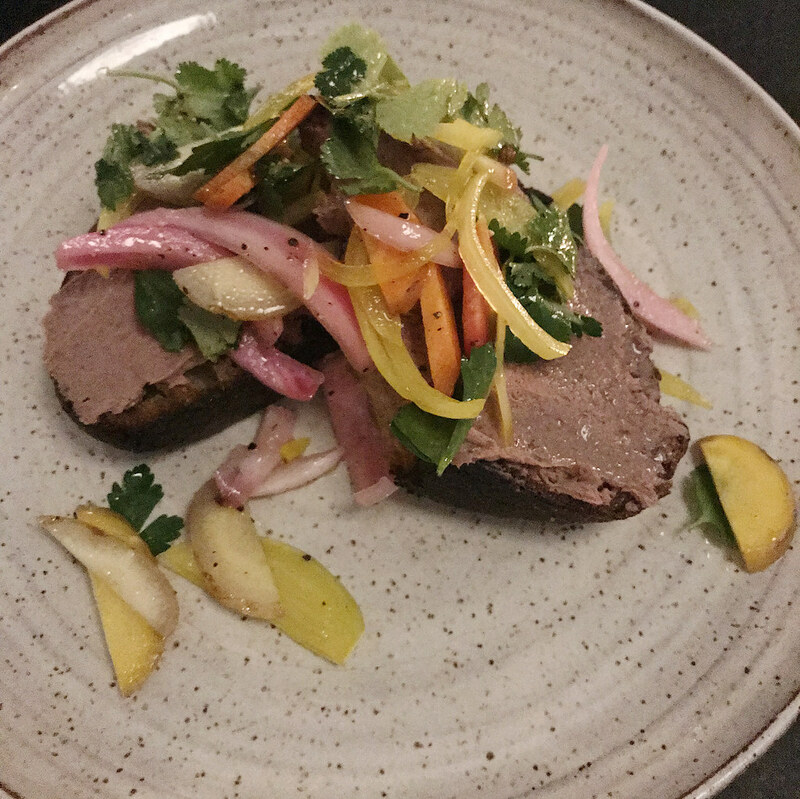 The new Drifters Wife is like the big sibling to the old space, its elegant menu and unique wines set against a cooler, sophisticated backdrop. 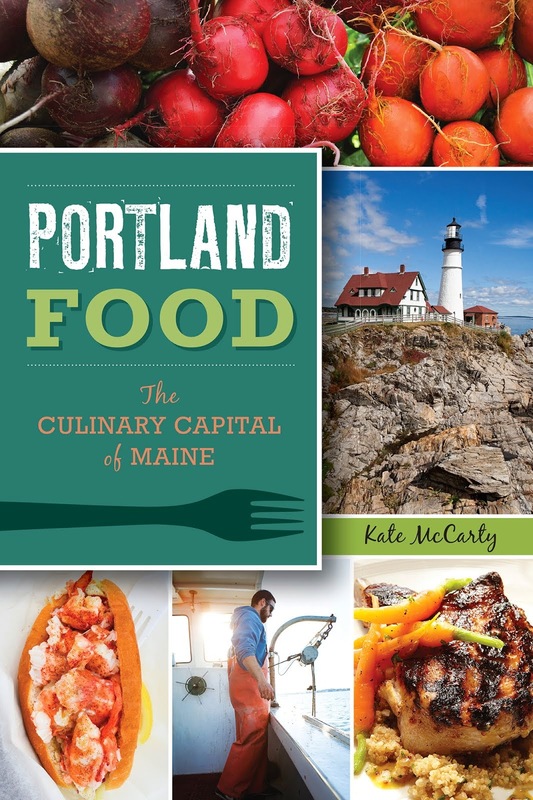 As anyone who has visited the restaurant before knows its price point is high, so it's not for the faint of wallet. But the new space elevates the experience, with more of the same expert natural wine picks and delicious small plates.